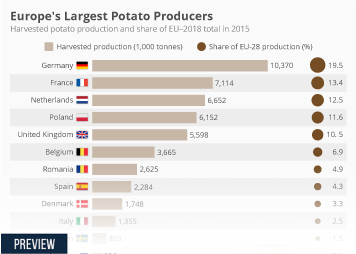 Thanks to its variety of natural resources and land conditions, Europe is an important region for the global agricultural industry, both in terms of agricultural land and agricultural production. Traditionally, the industry can be divided into three major sectors: farming, fisheries and aquaculture and forestry. The latest technological developments, such as the use of agrochemicals for fertilizers and pesticides, have sharply increased yields from cultivation. Organic farming represents a special sector of the agriculture industry which is currently gaining more and more popularity. Organic farming applies a method of crop production that involves abstaining from the use of pesticides, fertilizers, genetically modified organisms, antibiotics and growth hormones. Spain and Italy are particularly up-to-date in terms of organic agricultural land and organic producer numbers, with roughly 1.97 million hectares and over 52 thousand producers, respectively. In several European countries the total number of farmers has decreased, such as in the United Kingdom where, as of 2017, there are 125 thousand. These market players usually cover major agricultural product groups which can be divided into foods, fibers, fuels and raw materials. Another important segment of the farming industry is livestock. Livestock are domesticated animals raised and used in order to produce several different commodities. The main animal types are cattle, pigs, sheep, cows and poultry. The latter, as of 2015, represented the greatest number of organic livestock in the European Union.